Check out He Never Stopped Teaching, an article by Florrie on the Lewy Body Dementia Associations's webpage. 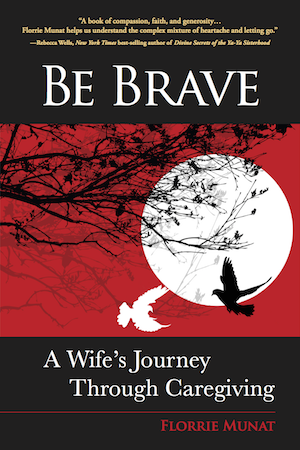 Be Brave: A Wife’s Journey Through Caregiving invites the reader to walk in the shoes of a caregiver whose spouse suffers from Lewy body dementia. On the day of Chuck’s debilitating stroke—the “day everything changed”—Florrie began chronicling their story with honesty, humor, compassion, and a desire for self-discovery. Six years later when Chuck died of complications from LBD, Florrie sifted through her random notes, journal entries, and written observations, and wove them into this moving memoir: a tribute to a loving marriage tested by unanticipated and transformational challenges. Read Florrie's guest blog on The Caregiver's Voice. Just a Little More Time features Florrie's article "Coming Home"–a reflection on scattering Chuck's ashes at a remote New Zealand bay. To order a copy of this anthology, click on the title above.